Choose one couple from each class. 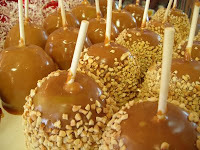 Tie caramel apples to a string tied to a broom handle and get someone to hold it for each couple. They race to see which couple can eat the apple the fastest. Fake starting and stop once to add chocolate syrup, the again to add whipped cream and last to blindfold the contestants.